Roy Ward Baker's 1958 dramatization of the sinking of the Titanic will hit Blu-ray in March. In an early announcement to retailers, Criterion says 'A Night to Remember' will be released on Blu-ray on March 27. On April 14, 1912, just before midnight, the unsinkable Titanic struck an iceberg. In less than three hours, it had plunged to the bottom of the sea, taking with it more than 1,500 of its 2,200 passengers. 'A Night to Remember' is cinema’s finest dramatization of this monumental catastrophe. 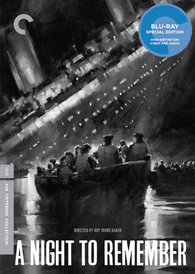 The Blu-ray will feature a 1080p digital transfer, an uncompressed mono soundtrack, and supplements include: Audio commentary by Don Lynch and Ken Marschall, author and illustrator of Titanic: An Illustrated History; The Making of A Night to Remember, a sixty-minute documentary from 1993 featuring William MacQuitty's rare behind-the-scenes footage; Archival interview with Titanic survivor Eva Hart; En natt att minas, a forty-five-minute Swedish documentary from 1962 featuring interviews with Titanic survivors; Trailer; and a booklet featuring an essay by film critic Michael Sragow. You can find the latest specs for 'A Night to Remember' linked from our Blu-ray Release Schedule, where it's indexed under March 27.